President Goodluck Jonathan has paid a heartwarming tribute to the General Overseer of the Redeemed Christian Church of God (RCCG) on his 73rd birthday. “Our Administration and the Nigerian nation owe you a debt of gratitude for your prayerful support and the productive spiritual leadership you continue to provide, not just for the millions that constitute the membership of the Redeemed Christian Church of God across the world, but also for the entire body of Christ in Nigeria. “On a personal level, I have left every meeting with you greatly strengthened and deeply inspired by your steadfast faith and commitment to the peace, stability, growth and development of our dear nation. 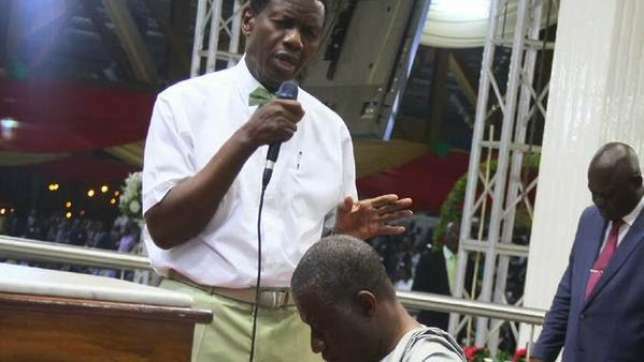 Similarly, the All Progressives Congress presidential candidate, Muhammadu Buhari has also congratulated the Pastor Enoch Adeboye on his 73rd birthday. The APC presidential candidate described Pastor Enoch Adeboye as a peace-loving citizen, in a statement released by the Directorate of Media and Publicity of the All Progressives Congress Presidential Campaign Organisation (APCPCO). “Your role as a nation-builder is being acknowledged by all, and I enjoin you to continue in your service to God and humanity,” said Malam Garba Shehu.